We are a shop dedicated to pet supplies, lovely pets always give us intimate companionship, so choosing a reliable product for them is not only your expectation but also our pursuit, GAKSY hope to give you a satisfying shopping experience and the most careful for your pet baby. Now let us give your lovely pet a kindly grooming and trimming experience! ❤Remove the protective cover and choose the proper port for pet nails. ❤Remove the inner cover by rotating rightward for quick nail grinding (quick nail grinding is suitable for pets with long and hard nails). ❤Gently wide the grindstone with an eraser or cloth for cleaning after usage. ❤For safety, please do not grind for more than 5 seconds at a time, and remember to adjust the grinding angle for better effect. ❤If you have never used a pet nail grinder on your pet, it's recommended to grind the sharp or overly long part of the nails first, but do not grind excessively to avoid bloodshed, while allowing the pet to adapt to the nail grinder gradually. ❤Let your pet see and smell the nail grinder, and listen to its working noise, which help decrease the sense of scare. ❤You can place your pet on a high place when grinding its nail cause pet is always tamer on a high place. ❤Please clean the surface of the grindstone promptly after usage. ❤This pet nail grinder is battery-powered, and 2 batteries are included. ❤The are 3 optional ports for pets of different sizes. ❤There inner cover can be removed for fast nail grinding. 【Suitable for Different Sizes Dog and Cat】 Our pet grinder is designed with 3 ports for small and medium pets, suitable for cats, dogs, birds, rabbits and other household pets. You can choose a proper port depending on the size of your lovely pet and features of its nails. 【Diamond Head with No Hurts】 Our grinder head is made of diamond material, which means it is more safer than a pet nail trimmer. It ever won't hurt your skin when you touch it directly. The entire inner cover can be removed for quick nail grinding and you no need worry the effective when you use it. Better, the grindstone is very easy to clean for hygienic use, the tips of how to clean is showed on description. 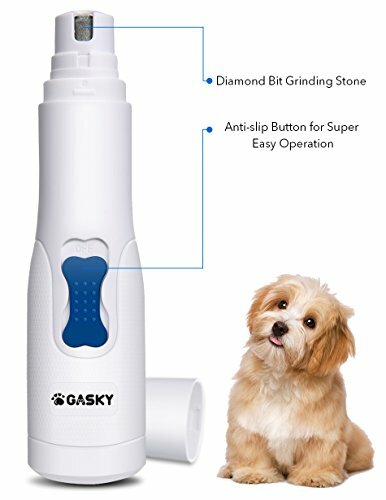 【Easy Operation for Nice Nail Cutting】 Simply push the power button and you can become a manicurist for your adorable pet. The ergonomic handle makes the grinder easy to keep hold of, promoting stability during the usage. Just take it and brings your baby pet a safe and comfortable nail cutting experience! If you have any questions about this product by Gasky, contact us by completing and submitting the form below. If you are looking for a specif part number, please include it with your message.